I’ve written at length about aging – general aging curve, putting aging curve, & aging curves for driving, approach shots, and the short game – because it’s a critically important topic when discussing the trajectory of golfers’s careers and projecting their performance going forward. What I’ve generally found is that golfers improve slightly from the early to late 20s, peak for most of their 30s, and then begin declining in the late 30s, with that decline accelerating in the mid 40s. A golfer who’s one of the best in the world in the mid 30s – think Adam Scott or Sergio currently – will decline to around PGA Tour average by the time they’re 50. This piece today will specifically focus on how golfers change between their late 30s and early 40s, basically the stage of his career that Tiger Woods is currently going through. How Much is Performance Affected by Turning 40? I gathered a huge sample of PGA Tour golfers for this study, including everyone with at least three years worth of results between ages 35-39 and three more between ages 40-44. I used the PGA Tour’s adjusted scoring average as my metric of choice; it’s only available going back to 1988 so my sample is golfers born between 1951 and 1972 (Tom Watson to Phil Mickelson essentially). That left me with 131 golfers. Then I averaged their performances in each season between 35-39 and 40-44 and compared. The average for the 35-39 sample was 70.66 (approximately equal to the 50th best player in the world) and the average for the 40-44 sample was 71.03 (approximately equal to the average PGA Tour cardholder/100th best player in the world). That indicates a decline of around a third of a stroke. My method is different from the delta method I used in the above studies; this study discards any golfers without enough data in the 35-39 or 40-44 group. Almost everyone discarded didn’t have any qualifying performance between 40-44 – meaning they weren’t good enough and dropped off the PGA Tour in their forties. This likely indicates that the decline is greater than a third of a stroke. The above general aging curve predicts a decline of half a stroke. What about Vijay (or Phil, Stricker, etc.)? There are certainly exceptions to this general rule of aging. Vijay Singh is often brought up when people talk about golfers aging because he had his two best seasons (and two of the best non-Tiger seasons ever) at age 40 and 41. Unfortunately, few players age as well as Vijay. Only five of my 131 golfers performed better than Vijay (who was 0.6 strokes better after 40 than before) and only 22% of my sample improved at all. Most of this improvement came from guys who weren’t at the top of the sport before turning 40 (Steve Stricker, Fred Funk, Hal Sutton), but improved after 40. Only two golfers who were top 25 level before 40 improved after 40 (Vijay and Nick Price, who only improved slightly). Every other top 25 golfer (Goosen, Mickelson, Tom Kite, Davis Love III, Jim Furyk, Greg Norman, Tom Lehman, Nick Faldo, Ernie Els, etc) declined after 40. Steve Stricker is another guy held up as an example of golfers play great into the 40s. He had his big renaissance after years on the fringes of the Tour at age 39 and has been a top five player in the world in the last decade. Only Vijay has been better in his 40s – at least since the 1980s (Nicklaus, Ray Floyd perhaps). However, he’s also an enormous outlier. The tableau visualization at the end of this post indicates such. Stricker’s not an example of anything except that sometimes something crazy happens. It’s vastly more likely that a golfer will follow the general trend than pull a Stricker. It’s important now to talk about what indicates a decline. I’ve chosen to use aggregate performance to measure performance – meaning I count performance in all PGA Tour rounds equally. When I say Phil Mickelson or Ernie Els has declined since 40 I mean that their overall level of play has declined. I understand both have won majors since 40, but they’re contending less overall (much less in Ernie’s case). Turning 40 doesn’t signal the end of a golfer’s professional career, but it does indicate they’ll be playing worse, contending less, and winning less going forward. When Tiger returns in 2015 it will be his age 39 season. His age 35-38 sample includes 2011 (69.9) when he was injured/changing his swing, 2012 & 2013 (68.9,68.9) when he was on top of the world, and 2014 (71.1) when he was injured again. Simply aggregating those seasons equally yields an average of 69.7 which would be the 9th best age 35-39 in my sample. 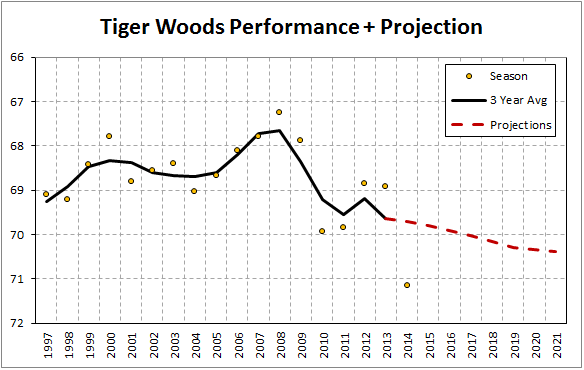 Simply applying the amount of decline I found above to Tiger would leave him as something like the 15th-20th best player in the world in his early 40s. All that ignores any more specific injury concerns and just applies my general model. That shows what an uphill battle Tiger is facing to remain towards the top of the sport. Even if he comes back healthy from this back injury, age is still going to erode his abilities steadily over the next half decade.